There is a place in Florida that does not have the very best in beaches, the most Caribbean-like climate, the best recreational opportunities or the hottest resorts or nightlife in the State. So, why is an island peninsula community of 15,000 residents on the Gulf Coast considered by many to be a “best kept secret”? For those in the know, it is affordable subtropical nirvana. Destin, Florida Destin is part of the Northwest Florida barrier island system on Florida's Gulf Coast. 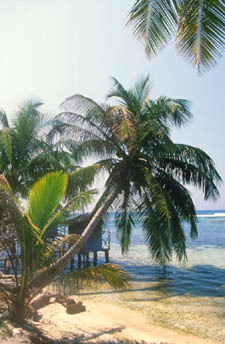 Information on beaches, activities and vacation lodgings. The Calusa Indians were the first to inhabit this corner of the world hundreds of years ago. Spanish explorer Juan Ponce de Leon explored the area and tried to convert the Natives to Christianity. Juan was not a welcome guest or happy camper, and after being wounded by the Calusa in battle, he retreated to Cuba, where he eventually died. During the 1800s' the area served as a cattle- shipping town, where cattle would be loaded onto ships destined for Cuba. In 1869 the International Ocean Cable Company (later known as Western Union) established Punta Rassa as the Southern most end of the telegraph line. The telegraph operator at the time was George Schultz and he was probably instrumental in establishing the first of the hospitality properties to occupy this piece of real estate. For $1.50 a day Schultz and his wife fed the cowboys and permitted them to sleep on the floor at one end of the telegraph office during the cattle drives. Fort Myers Beach Online - A Guide to Fort Myers Beach Florida - with Dining Directory, Accommodations Directory, Information About Sports, Outdoors, Attractions, Sightseeing, Arts, Entertainment, Shopping, Real Estate, Visitor Information, Featured Web Sites, Events, and Other Southwest Florida City Guides. Goodland is a quaint fishing village on Marco Island in southwest Florida. This online guide offers entertainment, dining and visitors information. "Located on a barrier island just off the coast of Sarasota in the Gulf of Mexico is paradise personified, Longboat Key. This private island is only 7 miles from the Sarasota/Bradenton airport and a 2- hour drive from Orlando. Eleven miles of sandy white beachfront, overlooking the blue-green waters of the Gulf of Mexico, provides the ideal location rekindling those dormant love passions. Naples Area Quicktour - An Online Tour of Amenities, Attactions, Accommodations and Recreation for Naples On the Gulf of Mexico in Southwest Florida. Islands Sports Shop - Destin, Florida kayak, bicycle, and Scuba gear sales and rentals. Harborsurf.com Online guide to the Charlotte Harbor region in Southwest Florida. Pine Island - unique island on SW Florida's Gulf Coast! A Guide to Sanibel - Captiva Islands - Resorts, Beaches, Activities, Fishing, Dining and more. A Guide to Southwest Florida - With online city guides for Marco Island, Naples, Florida Everglades, Fort Myers Beach, and more. Includes hotel, restaurant and attraction information for visitors and tourists.